To use Search service, Java must be installed on the computer where the user is installing the search components (read more in section Prerequisites above). http – use this if you want to establish a direct connection with contentACCESS. If direct connection should be used, do not change the port number that’s prefilled by the setup package (8736), otherwise contentACCESS Proxy connection will be used automatically. net.tcp – use this type if Virtual drive and contentACCESS are installed on the same machine; this is the fastest and most recommended connection type. 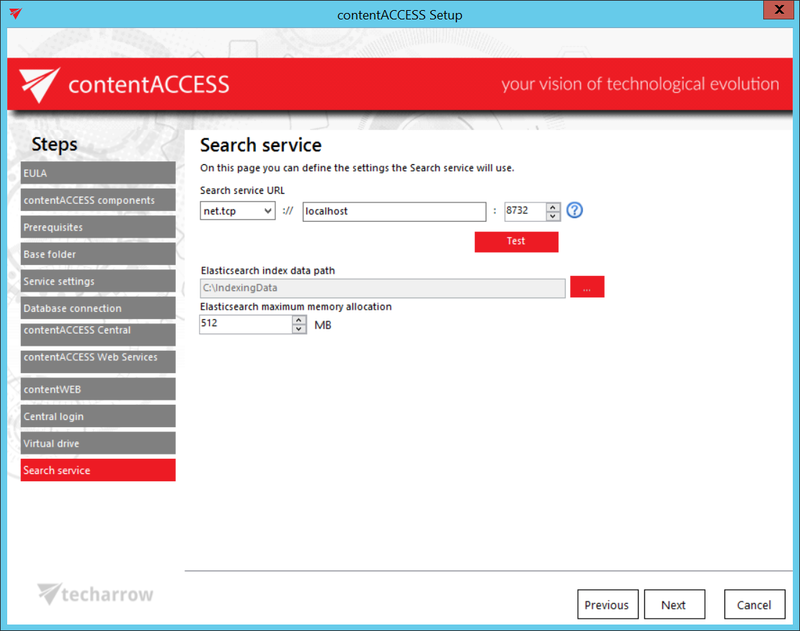 The installation package writes/reads these parameters into/from the Search service settings section of Central Administration (System -> Services group -> System page) during each install/product update. The path where the indexes will be saved. This path must be filled unless you can’t continue the installation process. The maximum amount of memory in megabytes which can be used by the Elasticsearch service.